At long last the kitchen I’ve been making over in my head for eight and a half years is underway!! As life has taken lots of twists and turns through our years here, so have the kitchen plans, and today I want to share with you what direction we’re finally going. 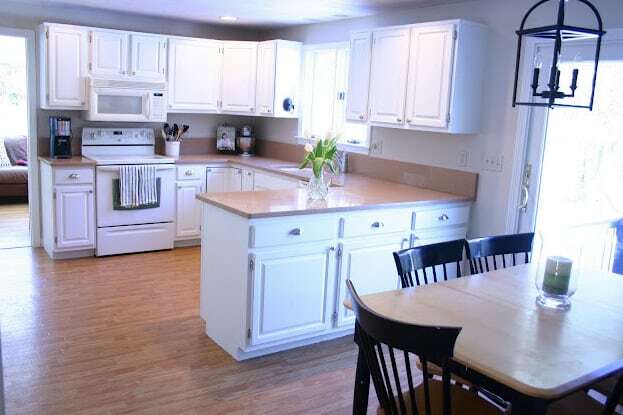 Our kitchen when we first moved here and I painted the cabinets and walls until we could fully remodel. It doesn’t look bad from afar but the cabinets are original to the house, built in 1985, and are not quality cabinets to begin with. Two or three years ago I put together this design board when we were planning on taking out the wall between the kitchen and dining room (the room through that doorway above) and changing the layout to include a huge island. 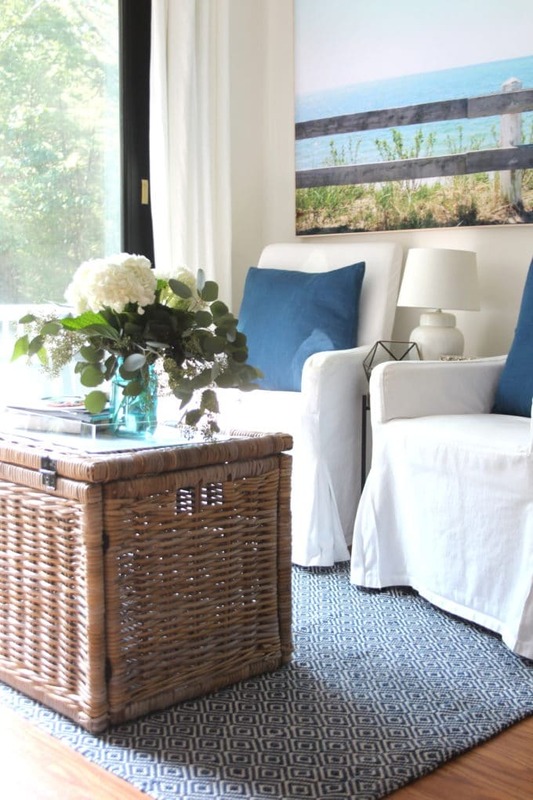 The original plan…..
My long time vision for this makeover was a navy or wood-toned island and white perimeter cabinets, with lighting over the island to coordinate with the large linear light that we already have over our table. I know you’re shocked, no one does these! HA. White shaker cabinets are simple and timeless and work with so many different designs. They were a no-brainer for me. 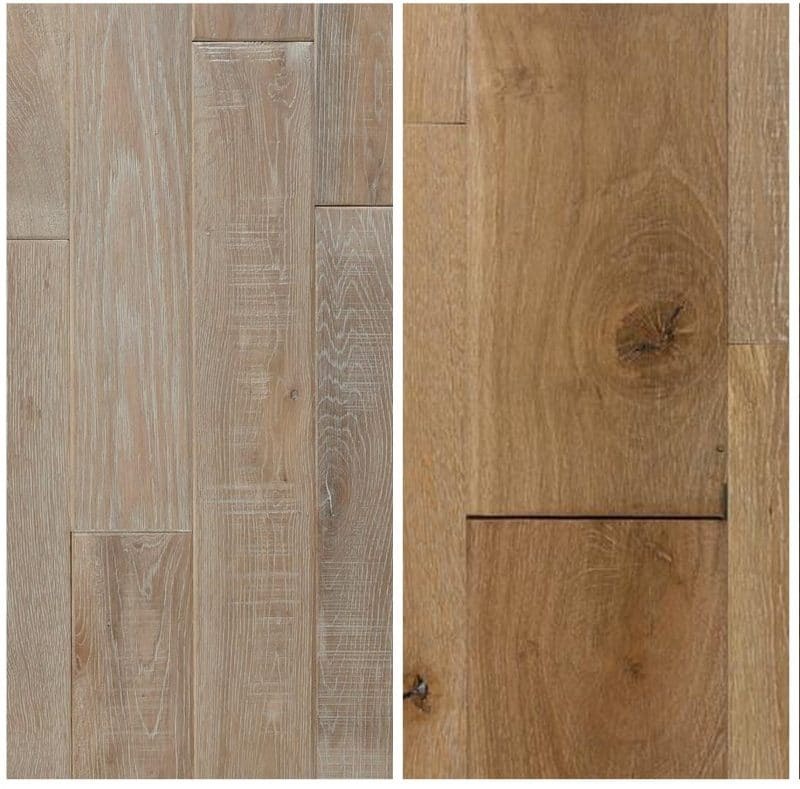 Out with the vinyl sheet flooring and in with solid white oak hardwoods to match the adjacent rooms. Our floor project is going to be a huge undertaking and I can’t wait for this part the most!! 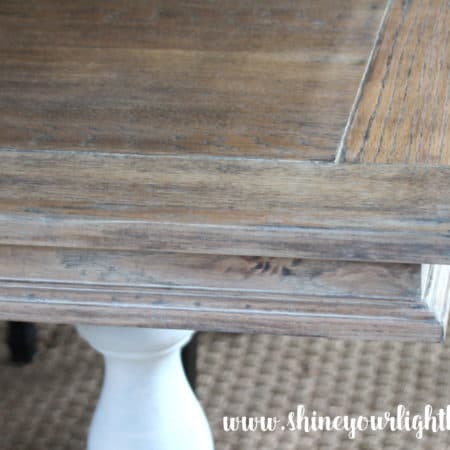 I’ve tried a bunch of different stains and stain combinations on samples and we’re loving some of the lighter stains. More on this topic coming soon!!! Although I really, REALLY wanted to do cabinet panels on our appliances to integrate them into the cabinetry, part of tightening up the budget from our original plans was ix-naying this custom feature. 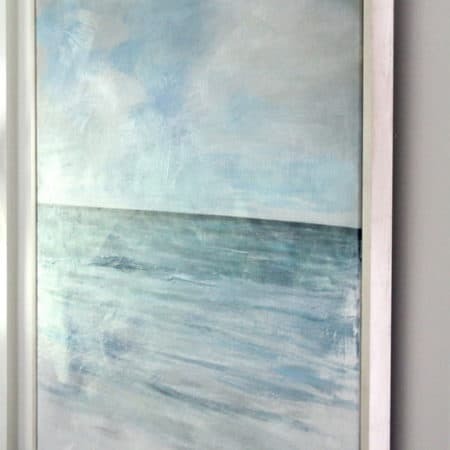 This saves us on not only those custom cabinetry panels, but also on panel-ready appliances which are often more expensive than the stainless steel version (ridiculous considering they come without a finished panel on the front!) Our appliances are all slowly dying (we’ve already replaced the dishwasher and stove) and I can totally live without the cabinet panels!!! We’ve been using the kitchen table space for this little seating area for a few years. With the remodel we had originally planned to install a beverage center with a sink, wine fridge, dishwasher drawer and cabinetry for all our barware, coffee maker, etc. on this wall. Instead we’re keeping the seating area as is for two reasons – 1/since this space is typically where a kitchen table goes, if we ever sell this house, the kitchen would still be considered an eat-in-kitchen without cabinetry here, and 2/taking this wall of cabinetry/plumbing/electrical out of the plan saves us at least $15,000! We use and enjoy the seating here on a daily basis so we’re fine with letting that part go. Since I tiled the fireplace surround, hearth and bathroom floor with marble I always envisioned using marble in the kitchen somewhere as well – either as the backsplash or the countertops. Marble is not impervious to stains and etches easily, and we’re red-wine-drinking, red-sauce-eating, low-maintenance-loving people, so we’ve done a lot of thinking on whether marble is right for us, and are also considering quartzite and quartz. One way or another it will be light, bright and not baloney colored!!!!! 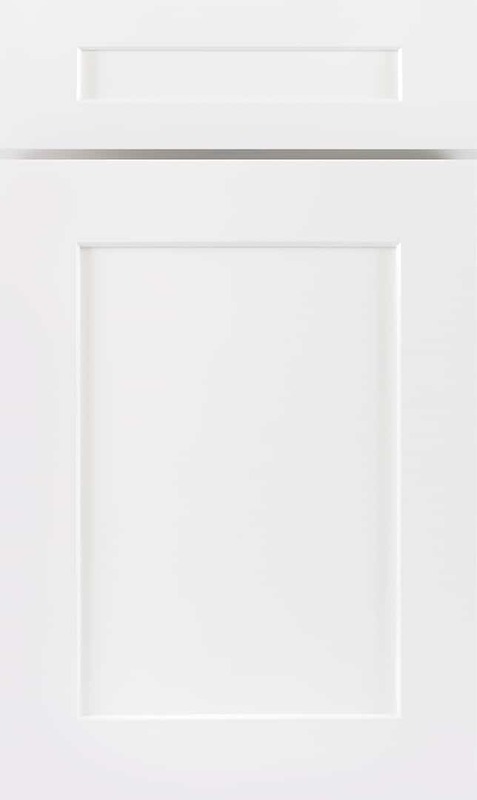 Remember the weathered finish I gave our existing pantry doors to try out the look of antique doors in our home? One of my plans to bring a unique element into our new kitchen is to add some real salvage doors to this wall. The wall in the middle will be removed and reframed to accommodate double doors that have some patina and SOUL! We’ve been looking at local architectural salvage places online and tomorrow we’re taking a road trip to check some out! I’ll let you know if I find any treasures. I have in mind something like this, what do you think?? Check out my pantry board on Pinterest for lots of gorgeous salvage doors to bring some character to new interiors. The cabinets, floors and countertops are all the major elements that I wanted to be pretty classic and timeless. Lighting, hardware and accessories really differentiate one kitchen from the next, and I’m so looking forward to all those details! 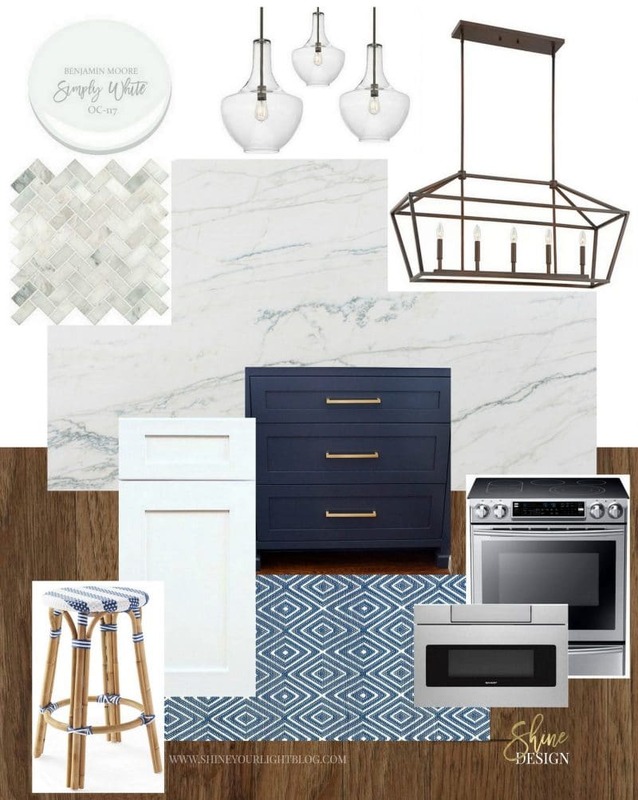 Our cabinets arrive at the end of February, and in the meantime I’ll be diving into all the decisions, demo, DIYs and pretty things of this kitchen remodel! Thank you for your encouragement and ideas, and for sharing this long awaited renovation journey with me, my home-loving friends! I’m so looking forward to hashing this all out with you! So excited for you! While we have done a few updates over the years in our 27 year old kitchen, we are now deciding just how big a reno we want to tackle. I too had wanted to take out the wall between our kitchen and dining room, but it is load bearing, and has both electrical and water pipes as well and just is not cost effective. I may change the doors leading into our dining room to glass paneled however so when closed we still get light. I see so many beautiful kitchen remodels, but know we need to keep it in the $$$ for resale purposes. 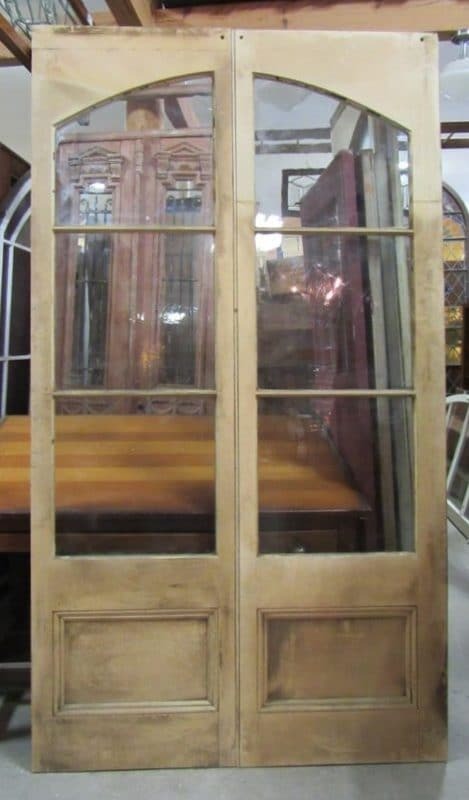 Lauren we have had a single French door from the kitchen to the dining room until now and I did love it for letting the light and it’s just a pretty detail, that would be a nice addition for you! When we had half the wall taken down last week the contractor did move an outlet and also a central vacuum receptacle but it wasn’t too bad. I totally hear you on resale value – and having a separate dining room is desirable to a lot of people. Thank you as always for visiting and leaving such kind comments. I appreciate you so much! Lol have been looking forward to this almost as much as you! Whatever will you have to talk about once the balogna counters are gone? Ok, love all your ideas except for the glass pantry doors. While I like the look I’d be concerned about keeping the interior meat all the time but maybe that just me. Enjoy your well deserved reno! Isn’t that the truth Denise – what will I talk about when our old counters are gone?!! :). 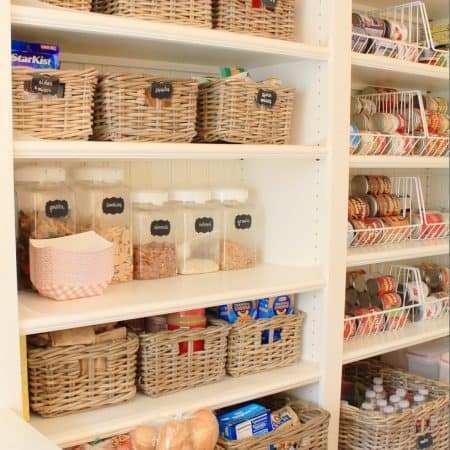 I’ve been debating about pretty glass doors I see for the pantry because of what you said – having to keep the pantry tidy would drive me nuts. I think if I did glass I might replace the existing glass with pebbled or frosted to hide the contents behind them! I can’t wait to see what you do with this long awaited project, Lisa! It’s going to be great! Thank you so much Jenny! We’re so fired up to get it done! Oh Susan that is exciting!! I just looked up BM Fossil and that is so pretty! That’s too bad about the expense of the marble recut – it’s actually more expensive to recut it than replace altogether? Marble is such a timeless material and worth saving if at all possible! Good luck with your kitchen, hope you love it all! Lisa, love all the ideas. Pray all will come to pass for you. 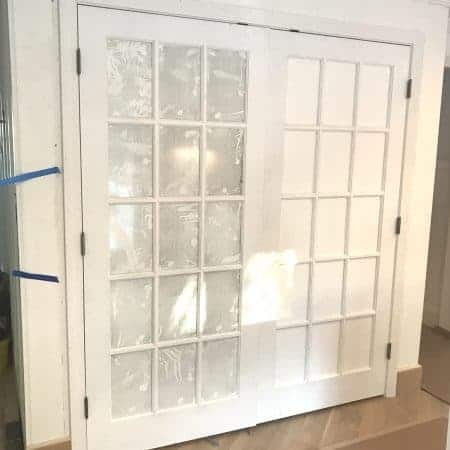 The pantry doors are beautiful and I would do a JoannaGaines finish on the glass. She had a mercury looking finish put on them to hide what was in the pantry. Looked really great. Enjoy the process. Hi Mary! 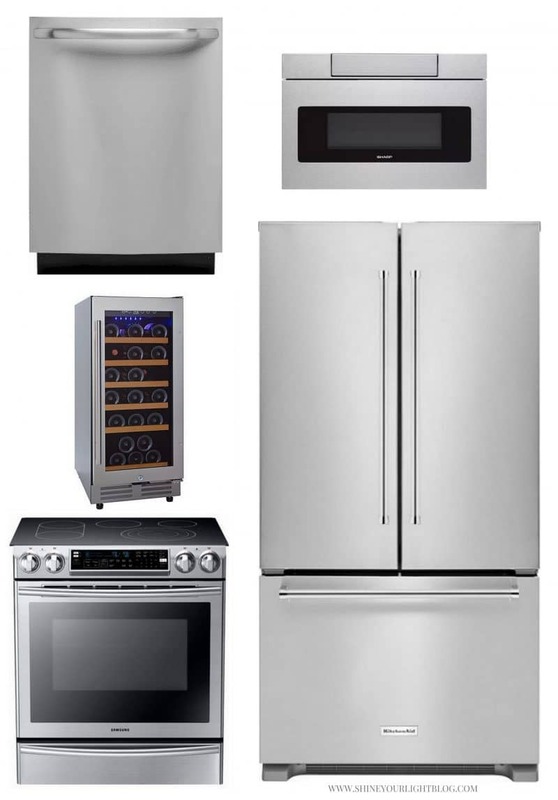 I saw a picture on Pinterest with mercury glass doors on a refrigerator, LOVE that look! Definitely something to consider!! Finding the perfect sized salvaged doors has been a bigger challenge than I anticipated but I’m still on the hunt! Thanks for your kind words, I appreciate you stopping by! Lisa, I love your plan. I am sure you are so excited to get moving on this…it’s going to be beautiful! Thanks so much Shelley! It was so fun to follow along with your kitchen renovation….I’m hoping I can handle the house upheaval as gracefully as you did! i LOVE this plan, lisa! i can’t wait to see your kitchen dreams come true! Thanks Cassie and I can’t wait to follow along with your progress too! What fun, planning a kitchen remodel!! Your choices are the ones I would go with also, classic and elegant and most of all timeless. Looking forward to following along!! Thanks for the recommendation on the floors Devlin, I’ll look into that brand! Love the sound of old-world European, that would be right up my alley! Lisa, I see you’ve done a really good job planning every single detail. I have no doubts about the outcome… It’s going to be a gorgeous kitchen! I would go with quartz for the counters, it’s such a great product, the one that looks like marble is beautiful too. I’ve warmed up to the idea of quartz – there are so many pretty options out there and you’re right, it’s such a great product – so resilient!